Since shrimp is the world's most popular fresh seafood - only canned tuna tops shrimp in popularity - The Early Show resident Chef Bobby Flay is sharing his recipe for shrimp on the grill. To liven up the dish, he uses rosemary skewers instead of just regular wooden ones. 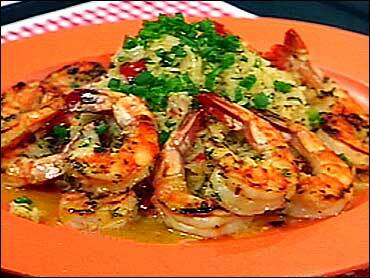 It's a great way to give the shrimp flavor and it's a fun way to serve the dish. Rosemary is highly aromatic and has hints of both lemon and pine. Flay says shrimp should only take 2-3 minutes to cook. If they are overcooked, they taste like rubber. As with any recipe, to ensure a great meal, you should have the right ingredients. Shrimp should have little odor, just a hint of the sea, clean, and bright. They should not smell like a bait shack. And shrimp should not appear dusty yellow -e specially around the neck. This is an indication of excessive sodium bisulfate and means the meat will be rough. Preheat grill. Combine oil, garlic and rosemary in a large baking dish. Add shrimp and toss to coat the shrimp in the marinade. Cover and let marinate in the refrigerator for 30 minutes. Remove 1-inch of leaves from the bottom of each rosemary branch and with a sharp knife, cut the end of the stem on the bias to make a slight point. pepper and grill until just cooked through, 2-3 minutes on each side. Place stock in a medium saucepan and reduce to 1 cup over high heat. Add beans and remaining ingredients and cook until warmed through. Season with salt and pepper to taste. Spoon beans onto each plate and top with 2 shrimp skewers. Garnish with parsley leaves. Rinse the shrimp heads and shells quickly under cold water, and place them in a stockpot with the remaining ingredients. Bring to a boil over high heat. Reduce the heat to low and simmer for 10 minutes. Turn the heat up to medium and cook for 30 minutes. Allow to cool thoroughly, strain and refrigerate. Keeps for 1 month.